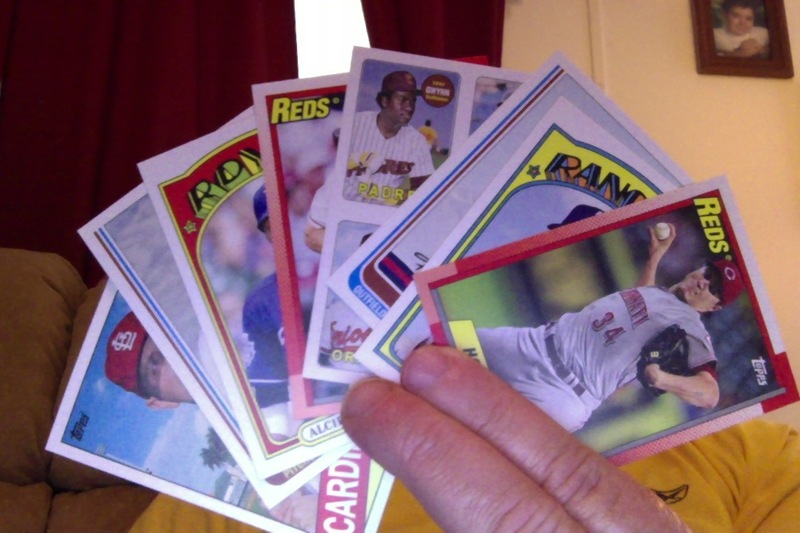 Indians Baseball Cards: Tribecards from Outer Space: Where did Saturday go? Tribecards from Outer Space: Where did Saturday go? I am accessing the manager list most recently posted (08/04). I think that should cover everyone's cards to this point. Oh yeah, draft will be later tonight, too! Wahoo!! 2013 Topps Archives. 8 cards per pack. I didn't realize I still had any of these! Sweetness!! We not only hit for the cycle, we hit it including a 4x Sticker! That is awesome. Congrats to everyone. See? This was worth the wait. *Unless there is a huge outcry, I will CAREFULLY cut the 4x sticker apart and each manager will get their respective player. Only the affected managers' comments will play a part in my decision. Other comments will be read and enjoyed. I'll defer to the others, but I'd rather have a tiny Sandberg than none at all! I say cut 'em! Thanks. I've already got that Gwynn/3 other players card, so I say dice dice, baby. I say you should drink a fifth of scotch, put on a blindfold, and THEN try and cut those stickers. Haha, you guys are nuts! Everyone: "Chop that sucka up! I want mah mini sticker!" Keep it in tact! I will give up my share so the card may remain mint! By order of King Tribecards (Hahah, nice Dayf! ): I will keep the 4x in tact until the end of the season. If Workman is drawn as the chosen recipient, the stickers will remain in tact and shall become his. Should the fates go another route, the sticker shall be divided among the managers such that each may prosper in the good fortune. Unless ScottCrawford chimes in such that we have a tie in what to do. In that case, I shall flip the card old-school style. Heads-up, card stays in tact. Heads-down, chop 'em up!